One of the things I really want to do, in case I ever find myself with a reliable mule, is to ride long distance. In the UK it’s not so easy to find lengthy, off-road trails as it is in the US or Australia, but it is certainly doable. 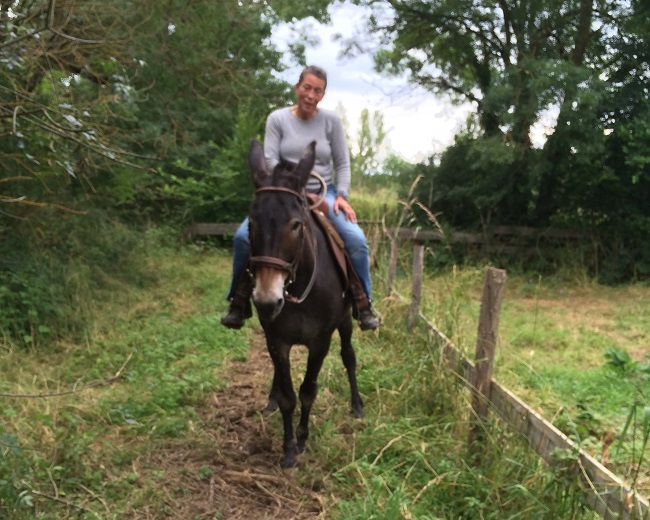 The lady telling this week’s Mule Tale is no stranger to epic adventures, having already ridden for two months across France and Spain – and she did it sidesaddle, carrying all her gear herself! 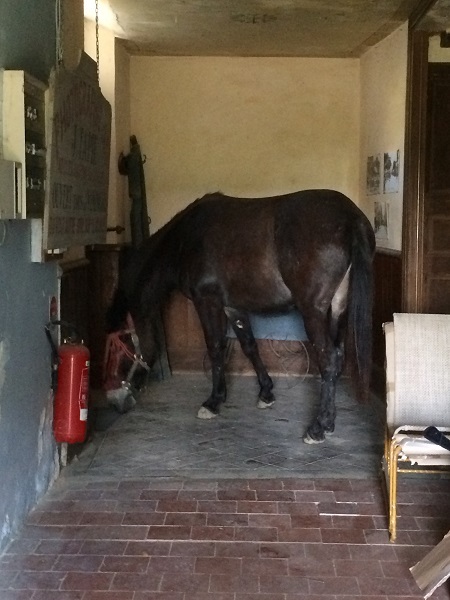 I feel this Tale hardly does justice to what an adventurous life she’s had, but it does introduce you to her wonderful mule, Ulysse, with whom she hopes to explore many more trails. Well, with a mule named that, how could she not! All images are copyright © Denise Siméon Lambert. I have been riding horses all my life and since the past few years, I have appreciated long distance riding. I rode from my house in the Gascony region of France to Santiago de Compostella with a friend, which was quite an experience of 2 months on the famous pilgrimage trail in France and Spain. Then I fell in love with mules. I have always wanted one but knowing the difficulty in training them, I was a bit hesitant. I’ve trained horse, but knew nothing about mules. I saved a small male (jack mule as we say in the US) which took me one year to gain his confidence, but too small to ride. He is great and I still have him. But I wanted one that I could ride from the start, all ready trained.I spent a lot of time searching on the internet, calling around. Trained mules are expensive and I understand because of the lengthy training. 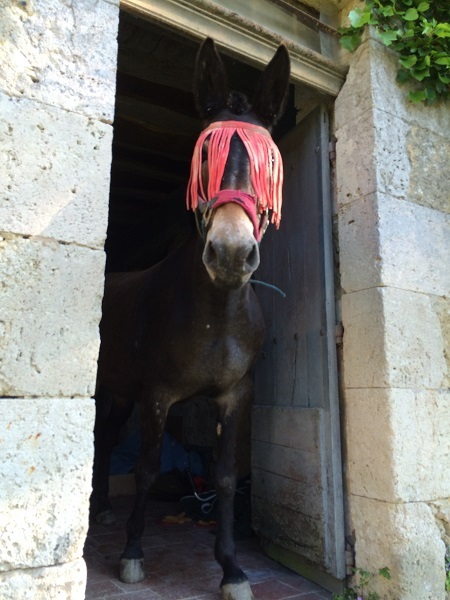 It took me around 1 year to find Ulysse and in France, you do not find big mules like you can find in the States. I saw him for sale on a French internet site. His father was a big jack mule from the Pyrenees and his mother a half draft horse with a bit of appaloosa blood. I was intrigued by his looks. I drove down to the south of France near Narbonne to see him and it was love at first site. He as everything I was looking for and I knew we were going to do a lot of things together. He actually chose me, which is almost how it should be with mules. He had been trained for outdoor riding and is not afraid of noise, cars, ect. I was afraid of not being able to fit him with the right saddle, but found a second hand western saddle which fit him perfectly, though a bit heavy for me, but so comfortable. We took a short time to check one and the other out. I walked him a lot to see his reactions and we are starting to go out on short distances, but I like not to go too fast. At 64 years old, I take less risk. What I am really planning to do, perhaps for next year, is to ride him on the D’Artagnan trail, from the famous musketeer’s birthplace in the Gers, to where he died in Holland (Maastrich). This is a 3000 km ride so it should be really a challenge. One develops a fascinating relationship with a mule. With Ulysse it was like we were destined to meet. He comes to me whenever I enter the field and is eager to do tricks and also test me. When I bought him I was not certain that he would walk up any sort of stairs, which is something we might have to do on long distance riding. He was in my back yard, so I opened the door and went up the stairs to the hall way. I did not expect him to immediately follow me and check the house out. He thought and still does, that it is very funny, so now I have to close all doors to avoid him even following me up to the bedroom. He is curious, which is a good quality. When you decide to buy and ride a mule, you must forget all your horse years. This can be great or frustrating. I read a lot of mule forums and every one has been through difficulties at one time with their long ears. Do not be afraid to ask for help. This is so important because a horse will forgive your errors but not a mule. 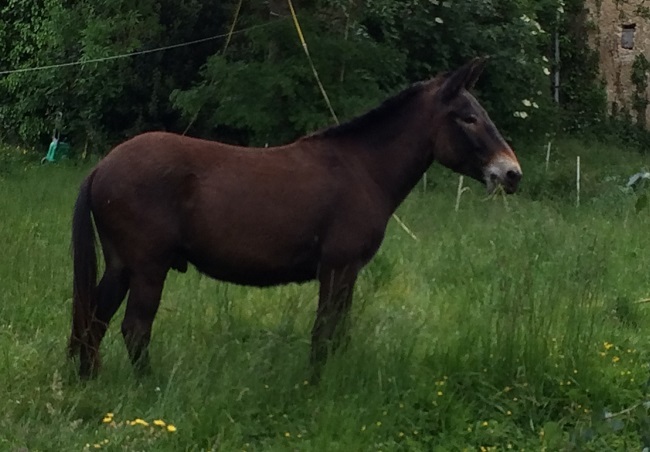 I have the luck to live near the French Pyrenees where you can find several mule trainers with good experience. Also, take your time to find the right mule which will be your life time partner. You will know when you see her or him. It’s always love at first site !